If you're anything like me, you tend to hold on to your email for months, years, or pretty much all of eternity. Now that I have things like Google Apps for Your Domain and IMAP, I can literally keep as much of my email as I want, and always get access to my full message history. 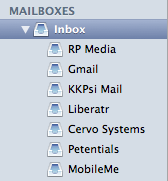 On top of this, I have 7 inboxes to check. You mean physically connects to the phone? Is it important to do it on an actual handset? Yes, I have yet another blog: this one is all about Drupal. Right now there are exactly 4 posts, but two of them came this week, so there may be an upturn in the posting over there. If anybody out there wants to write some tutorials, I'd be open to that. jQuery broken in Internet Explorer? Put your $(document).ready at the bottom! Read more about jQuery broken in Internet Explorer? Put your $(document).ready at the bottom! iPhone Web Clip Favicon Fun! UPDATE: the apple.com logo is now 152x152, they have scaled up some in the intervening years. Read more about iPhone Web Clip Favicon Fun! A while ago, Charlie and I were talking about how we could share our love of Drupal with the rest of the world. Our natural desires to create original content and extend the reach Cervo Systems helped us develop the idea for a website, a podcast and a community around making Drupal accessible to people with no knowledge of programming. Welcome Drupal Easy to our family. Boing Boing TV is an utterly amazing show. Watch it. Daily.